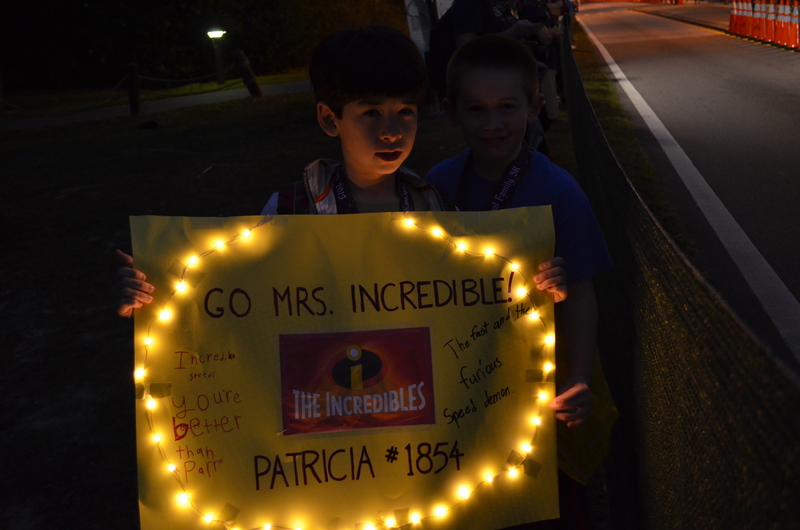 My boys were ready for me to run past during the 2013 Disney Princess Half Marathon on February 24th. Technology helped me see my husband and sons, and helped my boys keep about 10 minutes ahead of me while trying to find places to spectate. My youngest son came up with the “You’re better than ‘Parr'” statement on the left. He definitely gets that creativity from my husband’s side of the family! Photo: David Vollmer. 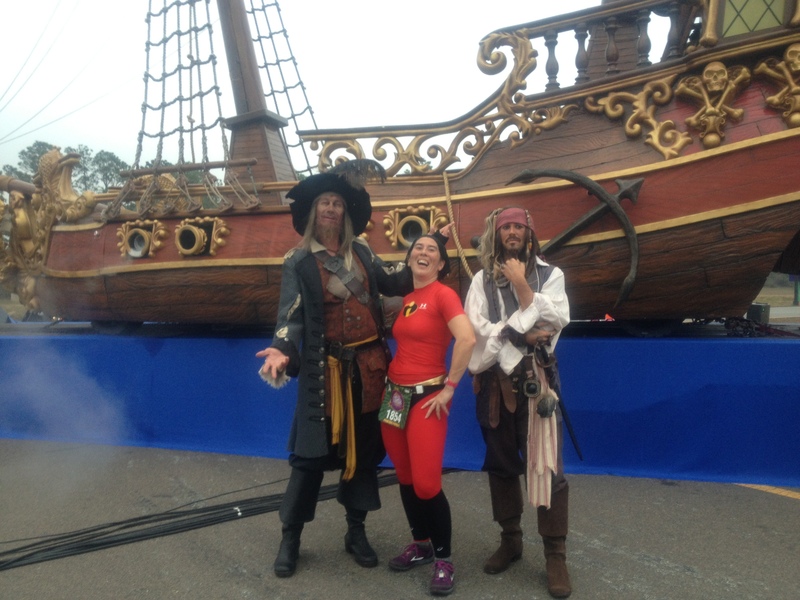 On February 24th I ran my second Disney Princess Half Marathon at Walt Disney World. I’ve written about the event before, from my costume to the race itself. I donned the Mrs. Incredible costume that I wore at this past Dragon*Con (most of which was conveniently made by Asics) and had a fun time. Much of the trip was a similar experience this year compared to last, but there were some notable differences. For example, it was about 20 degrees warmer at the start of the race this year. Also, runDisney opened the race up to several thousand more registrants, resulting in a much more crowded field. On a personal level, whereas last year I went with girlfriends, this year my husband and sons came along and made the brave commitment to rise at 5:00am to watch for me along the race course. This is the first time my kids have been along a race route to see me, and I was so happy about that. runDisney has many tools available to help you keep track of your Princess while on the route. For starters, the Spectator Tool gives any on-site spectator ideas of what time to be in place at the more popular viewing locations, based on the runner’s pace. Most notably is the Xacte platform that runDisney contracts with for all their races. You can sign up to follow your favorite runner for most runDisney races: enter the runner’s name and/or bib number and then choose whether you want the race results texted, Facebooked, or Tweeted to followers. My family decided to take advantage of a couple other tools to help us keep tabs on each other during the race. 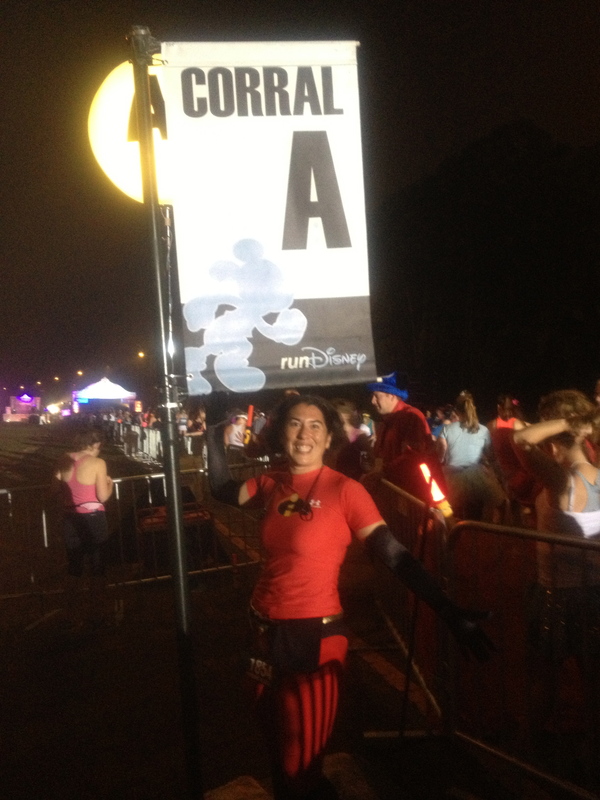 Corral A — where the serious runners start! What was I doing there? I don’t know! Photo: Patricia Vollmer. A light-up sign. Not necessarily because I’m super fast, but because I submitted a sub-2:15 hours time for a previous half marathon, I was allowed to start in “Corral A” for the race. This meant that I was taking off at 5:35am. With sunrise not until just before 7:00am, the spectator experience for the first 90 minutes would be in the dark. Last year I remember a spouse of a runner standing near the Shades of Green military resort on Walt Disney World. The sign was a huge cutout of his wife’s head and shoulders with blinking lights surrounding the edge. Running through in the low pre-dawn light, that sign was definitely visible and memorable (and I’m sure his wife was thoroughly embarrassed too). We wondered if my husband and kids might want to put lights on the sign they were making. We bought two strings of 20-LED micro lights from our local party supply store. These were easily clear-taped to the front of the poster. The battery packs were taped to the back. These lights were lightweight and didn’t create a burden on my husband and kids who had to fight the crowds on the monorail to get to the various viewing locations. When I ran past the Ticket and Transportation Center around Mile 4, at about 6:20 in the morning, while still dark, it was very easy to find my husband and sons. My husband texted me his precise location “on the left just before the drummers” and I could see the lit-up sign clearly. The next place my boys could see me was in front of the Polynesian Resort. They walked to that next location and set up about 10 minutes after they saw me pass. This was likely where they had the most time to rest, they were set up about 25 minutes before I ran past. 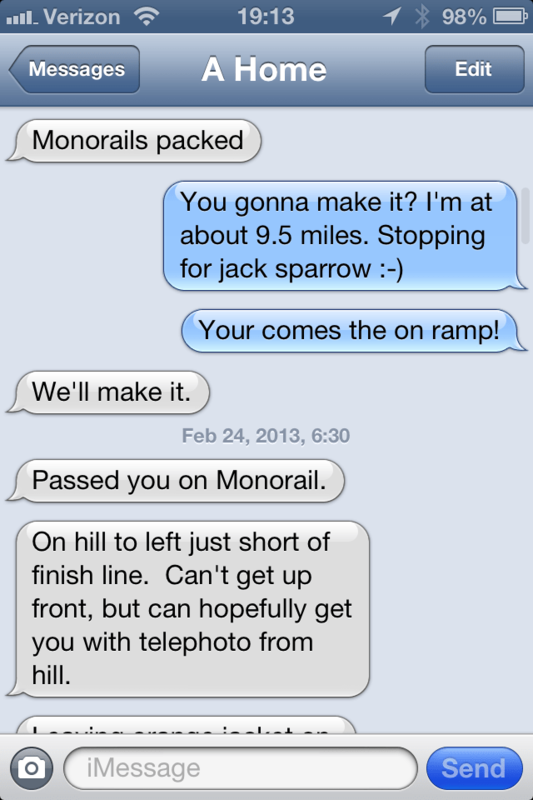 By the time I passed, the sun was shining, but thanks to iMessage, Dave was able to communicate his precise location. He was able to take pictures of me passing them at the Polynesian. I was in the middle of blowing kisses to my boys. I had ditched the black gloves somewhere in Magic Kingdom. Photo: David Vollmer. The poster made a huge difference for me being able to see my boys. Apple’s Find My Friends App. If you have an iOS device with an Apple account, and if other friends are willing to share the information with you, the Find My Friends app will let you track the GPS-enabled devices. Dave and I turned it on for the race, and he could see me along the route. Other runners were using similar apps with their smart phones to keep track along the route. For example, MapMyFitness’s newly-launched MVP subscription features live broadcasting with not only the runner’s position, but also the runner’s pace and other data that he/she might be transmitting, such as from a heart rate or cadence monitor. RunKeeper’s Elite subscription offers the same thing. Thanks to Find My Friends, my husband knew exactly when I would be passing the Ticket and Transportation Center near Mile 4, the Polynesian Hotel near Mile 7, and the finish line just outside of the the EPCOT front gate. In addition, Find My Friends helped my family as they passed me while riding on the monorail between the Polynesian Hotel and the finish line area. At the finish line, my husband was able to get several outstanding photos with the telephoto lens. They greeted me after the race with a Mickey Mouse rose and lots of hugs and kisses. The weather was very hot and I wasn’t quite as well prepared for this race as last year, due to a back injury. All of that combined with an extremely crowded race overall resulted in a much slower finish than in 2012. I completed this year’s half marathon in 2:28, which was 17 minutes more slowly than last year. But that’s okay; we had a great time, even if my boys were a bit tired during the day. They really enjoyed all the costumes and the Disney characters along the route. When they were at the Polynesian they were position right across the street from Lilo and Stitch, among their favorite characters. I’d like to give props to the fantastic ladies and gentlemen on one of the Princess Half Marathon Facebook groups that I chose to join. The ladies in the group helped me form a spectator plan for my sons, offered advice about costumes and we gave each other inspiration and compassion through our training runs, injuries and travel woes (thanks to a big winter storm that really made a mess of many of the Princess’ travel plans). Since I mentioned it in the text message above, I figured I’d show you the picture I got with Jack and Barbarossa! Image credit: Patricia Vollmer. 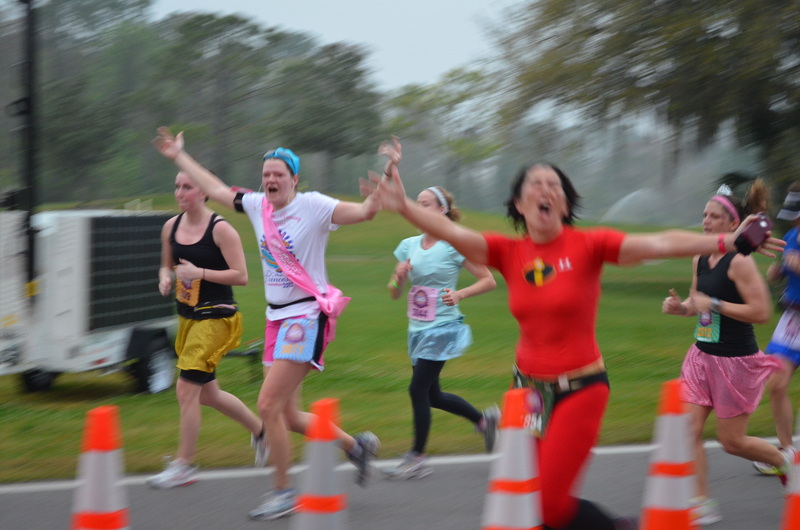 Are you interested in running a Disney long-distance road race? Subscribe to updates through the runDisney website to learn more about upcoming races, such as the Tower of Terror Ten-Miler, a Halloween-themed race through Hollywood Studios starting at 10:00pm! Pooped Princess! If you look closely at the red rose I’m holding, there’s a pair of Mickey ears sticking out of it. I love it! Photo: David Vollmer. Disney also features some pretty lofty running goals for those who really want to push the limits! The Goofy’s Challenge can be done during the Disney Marathon weekend in January: runners who complete the Disney Marathon and Disney Half-Marathon in the same weekend will earn a stunning third medal. This year runDisney introduced the Dumbo Double Dare at Disneyland: complete the Disneyland Half-Marathon and Disneyland 10K over Labor Day weekend and earn a commemorative third medal. While registration is open for the Tower of Terror race, unfortunately all of the Disneyland Half Marathon races are sold out for 2013. Are you running fans? Do you have friends or family members along the route to watch when you run races?